Buy a Dual Charge Solar Power Bank at a Great Price! with Dual Port technology You can Charge Your Phone & Tablet at the Same time, whenever & wherever You need to. Never Fear Smart Portable Chargers are here !!! With a Smart Solar Charger, Never Worry about Your Phone Running out of Power Again, with Battery Backup built in, our Portable Chargers will Power Your Mobile or Tablet as Fast as Mains wherever You are.. Essential Phone backup when you are on the Go, in the Car, Train, on Holiday or a Festival, and Now in 2017 all Around the House as well !!! Incredible Value for Money and Very Handy to have, Once You own a descent PowerBee Charger, you wont be without one Again. 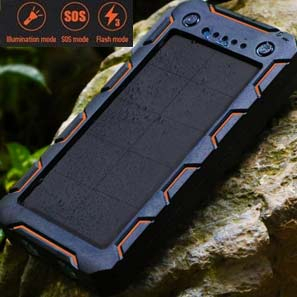 PowerBee Solar Power Bank Range, are the Best Portable Power banks we could source with 10 Years experience, our Battery Chargers have been Extensively Tested in the UK. If you're interested in turning environmentally friendly, our chargers can help you achieve your goal. Solar Phone Charger are now being used by Government Organisations to contributor to economic growth in rural communities, around the world, and are now a mainstream product.